The Car of Juggernaut, as depicted in the 1851 Illustrated London Reading Book. (17th century) From Hindustani Hindi जगन्नाथ (jagannāth)/Oriya ଜଗନ୍ନାଥ (jôgônnathô)/ Urdu جگنّاتھ‎ (jagannāth), from Sanskrit जगन्नाथ (jagannātha, “lord of the universe”) (Jagannath), a title for the Hindu deity Vishnu's avatar Krishna. English form influenced by suffix -naut (“sailor”). 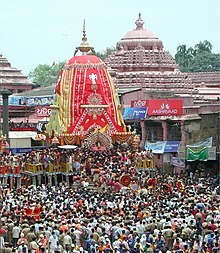 From British colonial era in India, witnessing the Rath Yatra (chariot parade) at Puri, Orissa. The festival features a huge annual procession, with a wagon of the idol of Lord Krishna. Pulled with ropes by hundreds of devotees, the wagon develops considerable momentum and becomes unstoppable. A literal or metaphorical force or object regarded as unstoppable, that will crush all in its path. (Britain, sometimes derogatory) A large, cumbersome truck or lorry, especially an artic. An institution that incites destructive devotion or to which people are carelessly sacrificed. Anon Mr. Hoopdriver found himself riding out of the darkness of non-existence, pedalling Ezekiel's Wheels across the Weald of Surrey, jolting over the hills and smashing villages in his course, while the other man in brown cursed and swore at him and shouted to stop his career. There was the Putney heath-keeper, too, and the man in drab raging at him. He felt an awful fool, a- -what was it?--a juggins, ah!--a Juggernaut. This page was last edited on 20 February 2019, at 02:04.